The name “Easy Eight” was the nickname for the final World War II production model of the famous Sherman tank. While never designed to battle heavy German armor, this model was more capable than the original Sherman tanks rolled out three years earlier. The Easy Eight contained key critical upgrades including a longer, high velocity 76mm gun and better armor. The nickname “Easy Eight” comes from the final two letters in its military designation, M4A3E8, which indicated an improved and heavier suspension system designed to deal with the extra weight of the new gun. This was effective at navigating the uneven terrain of the Ardennes Forest when in combat with intimidating German heavy tanks during the Battle of the Bulge. The Easy Eight was the only Sherman to remain in American service following World War II, deployed in Korea until the development of the M46 Patton. The Easy Eight was also the basis of the famous Israeli “Super Shermans” which saw action well into the 1970s. The Brickmania team has updated our ever-popular Easy Eight kit with several new features. Significant upgrades include the addition of new custom weapons from BrickArms: new extra-long Easy Eight Gun Barrel, Easy Eight Muzzle Brake, and a Short .30 Caliber Machine Gun Barrel with Ball Joint. This model retains its smooth-running tracks, functional suspension, rotating turret, and four opening crew hatches. It also comes with the iconic BrickArms M2HB machine gun as standard equipment. A perfect addition to this kit would be one or more WW2 US Tanker minifigures (sold separately). 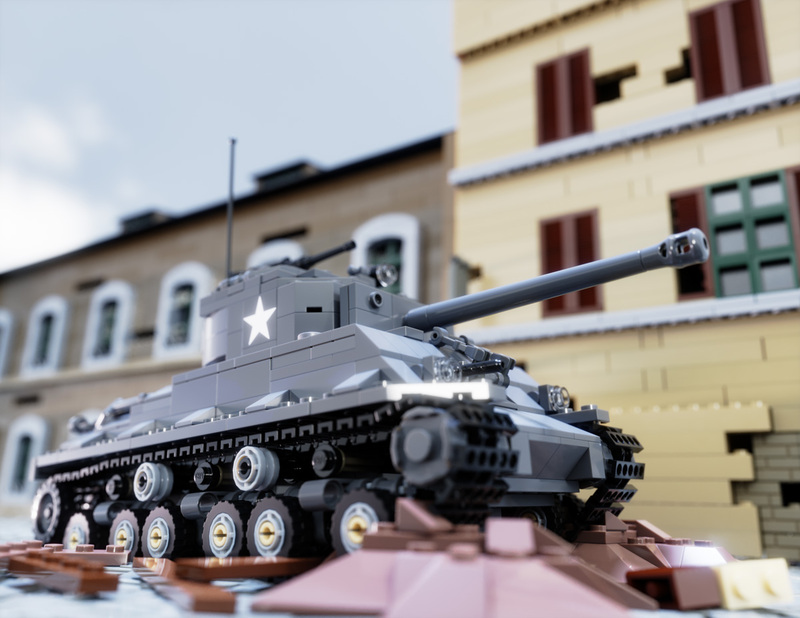 For those looking to add an extreme flair to your Easy Eight model, we have also created the M4A3E8 Hollywood Add-On Pack.